This Yantra, will bring about and increase in anything that you are seeking desperately or with intensity. For example, if it is money, you are after, the Yantra will increase money or if you wish to increase the food grains in your house, the Yantra will increase the quantity of food grains in your home. The Yantra should be prepared on any auspicious date as per the Hindu Panchang, like a Subh Tithi or Shubh Muhurat, like the Guru Pushya Yoga, Ravi Pushya Yoga or any Hindu festival. The Yantra can be prepared on a Bhojpatra and written with Ashtagandha, Kesar, Kumkum or Rakta Chandana. It can also be prepared on white paper using ordinary ink. Once, you have prepared the Yantra, you should worship it and light an oil lamp and incense stick before the Yantra. Then, it should be kept inside the thing that you desire. For example, if you want to increase your money, you can keep the Yantra in your wallet or the place where you store your cash. Notes- Please be realistic about your wish or desire and be sure that it the thing that you desperately hope to increase. The Yantra can also be written in Devanagari Script. 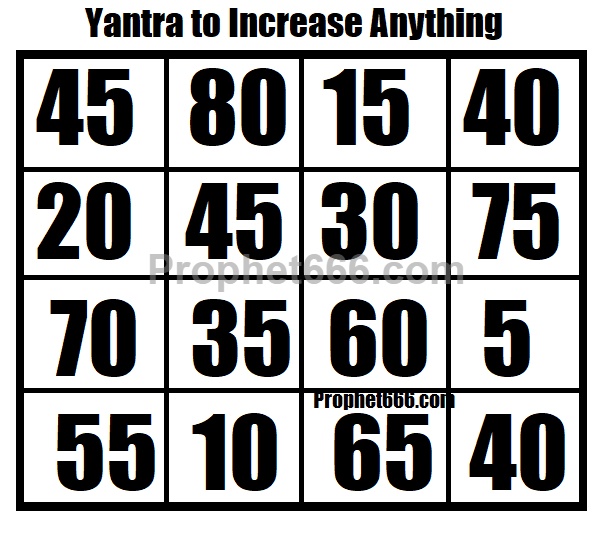 Please share your experience for the benefit of other readers, if you use this Yantra. Can I made and kept more than 1 yantra keep in different things like -car,cash,grain,land, house. 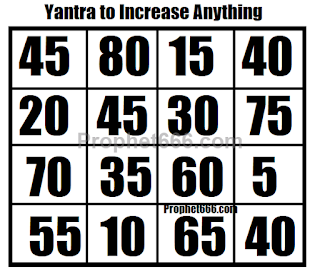 Yes, you can keep more that 1 Yantra in the things desired by you. This Yantra is not a Vashikaran Yantra and should be used only for increasing benefits from material items.